The Flush Pin Gage or Step Pin Gage is a GO/NOGO depth check tool. 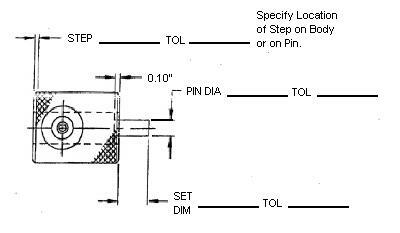 To use the Flush Step Pin Gage you insert the pin into the hole you want to check. The body of the Flush Step Pin Gage rests on the top surface of the hole being checked. The depth is read by feel using the step and it's relationship to flush with the end of the Flush Step Pin Gage. 2. Determine your part parameters. 3. Fill in the blanks on the sketch. 4. Fill in the blanks on the form below. 6. We will provide you a quotation, or call you if we have questions.